Last updated 01 April 2019 . By Katie Houghton. Piers Morgan would have plenty to say about this beauty. I've come to learn two things in life: not all hot dogs were made equal, and not all vegan hot dogs can take on the texture and gumption of meat. I've been vegetarian for almost 4 years now, and while fried chicken is a craving I may never quell, hot dogs have never been something I want, until i'm close to one. Two weeks ago? I was very close to some. While we'd only popped in to Hope & Ruin for a few quick drinks the night before, the vegan menu from in-house eatery Beelzebab had us coming back no less than 24 hours later. We quickly found out why; not only was H&R packed to the hungry rafters two days in a row, but their vegan menu is moorish and accessible in all the right ways. 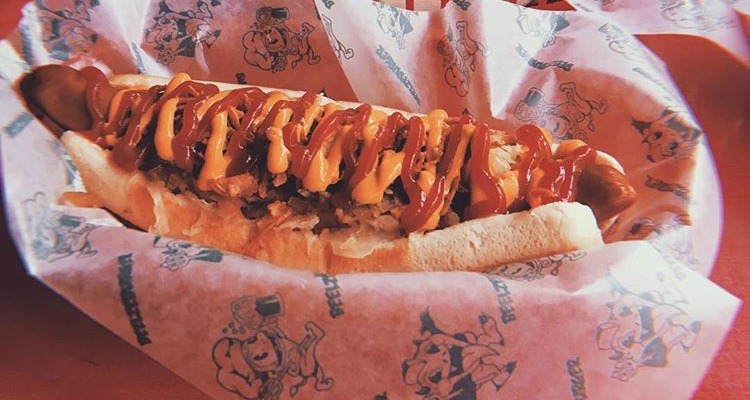 My husband opted for the mammoth 'Dirty Dog' with lashings of seitan 'doner' meat atop a 9" tofu dog, while my classic 'Krautwerk' hot dog was lovingly spoiled with sauerkraut alongside gherkin, crispy onion, mustard and ketchup at an impressive £5.95. The verdict? Holy f**k. Not only was the texture of the tofu dog both plump and solid against a tight bunned backdrop, the toppings had the right twang, with just enough sauerkraut to give you the fermented feels. Whatever vegan mischief these guys are getting up to in the kitchen, please, please, PLEASE continue. Beelzebab can be found at Hope & Ruin: The Hope & Ruin, 11-12 Queens Rd, Brighton BN1 3WA. Food is served every day of the week.